The client is into real estate and is based out of the USA. After checking out our 3D modeling and animation portfolio and the kinds of projects we have executed for other real estate clients, they offered an engagement for this project which required creating 3D Modeling and Animation for the real estate projects which they own. Outsource2india had to use Google Earth images based on the address links given by the client. After getting specifications from Google Earth along with the inputs from the client, our team had to create the basic shell of buildings and model it in 3D. The requirements were technically demanding, since the client needed value-additions. O2I suggested color coding every building and this meant categorizing each structure according to a predefined nomenclature and type of the building. Further, for the convenience of the client's customers, we suggested that the 3D models were annotated and tagged according to predefined client's specifications. 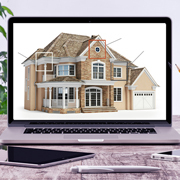 With these value-additions, there was a high level of interactivity, and customer could visualize through virtual reality and get a realistic view of different perspectives of the property they intended to occupy or buy. There were no major challenges faced since we were familiar with this kind of a project. The client was satisfied with just getting a 3D Modeling solution, and with our suggestion of annotation and tagging, along with interactivity; the client's prospect of increasing sales was noticeable. To integrate all of these elements together, for this project we used Adobe After Effects, SolidWorks, and Autodesk Maya. Outsource2india has worked on over a hundred real estate clients offering 3D modeling services for the past 20 years, which has given us a wealth of observations and learning experiences. These observations and learnings came handy and were used effectively for this project. The client was satisfied with the execution of the whole project, highly competitive pricing, and faster turnaround time. Further an introduction of annotation and tagging along with interactivity turned out to be a highly promising marketing idea for the client. This project was just the beginning of a long-term working relationship, and the client is looking forward to working with us on other projects as well. Outsource2india is one of the most prominent creative design service providers in India offering a wide range of annotation and tagging services to clients belonging to diverse industry verticals. We don't just concentrate at the deliverables, but strive to go over and above the job requirement to provide value-additions to the clients, and this differentiates us from our competitors. If you have a unique 3D modeling requirement, contact our team today, we will be glad to provide you a customized solution.